Sister Mary Clare Boland is surprised to be celebrating her 70th Jubilee because her body has made every step of the way a challenge since childhood. “From the time I entered, I have had problems with my hips and my neck, plus arthritis,” she explained. “My family didn’t expect the community to keep me,” she recalled. “My brother said he’d keep my trunk in the car and would come back and get me after supper.” By the time he returned, she was dressed as a postulant. Born the youngest child in a Seattle family, she attended Holy Family School, where she was taught by Sisters of Providence during the Depression. Inspired by their example, Mary Clare entered the religious community in 1947 after graduating from Holy Rosary School. 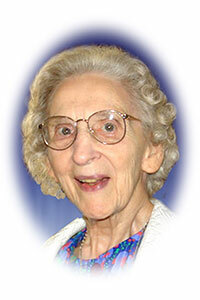 She professed first vows in 1948 and was a patient visitor for several months at Sacred Heart Medical Center in Spokane. Next, she taught grades 5-8 at St. Joseph Academy boarding school in Sprague, Washington. She continued teaching in Wallace, Idaho; Missoula and Great Falls, Montana; Seattle and Sun Valley, California. She also served at Providence Heights in Issaquah, Washington, directing the education bloc and teaching practicum for junior sisters. Her neck and back problems never went away, necessitating frequent surgeries and periods of rehabilitation. While recovering at St. Joseph’s Medical Center in Burbank, California, she was introduced to spiritual care ministry and became a patient, compassionate person at the bedside of others. “I loved it, just being able to walk with those in pain and suffering, to be present and support, to give hope,” she said. In 1973 she began a more than 20-year ministry of caring for older sisters at St. Joseph Residence (SJR) in Seattle, holding jobs from driver to superior. After taking spirituality classes and spending a year in clinical pastoral education studies in Steilacoom, Washington, she worked in pastoral care for a year at Providence Seattle. From 1979 to 1983 she directed the pastoral care program at St. Peter’s Hospital in Olympia, Washington. She returned to SJR as assistant superior and then took over pastoral care at Providence Seattle in 1990. She retired in 2007. Despite her pain, Sister Mary Clare keeps moving, visiting other sisters at SJR and keeping up with what’s happening in the religious community. “While I’m here on this earth, I use my time as best I can to help others.” She is grateful for every moment of her life, and especially for the doctors, nurses, sisters and staff who have cared for and supported her, for a loving extended family of many cultures, and for gifted lay women and men whose collaboration with the sisters is where the Church is moving today.